As China’s economy slows and growth in the developed world remains anemic, governments across Asia are working to keep their economies on an upward trajectory. In Sri Lanka, where I am prime minister, the challenge is to find a way to accelerate our already steady economic growth. One thing is clear: We cannot expect the rest of the world to welcome our economic ambitions the way it once opened its arms to China’s rapid rise as an economic power or — in earlier decades — cheered on the growth of Japan and the Asian Tigers, including South Korea. Open trade is under attack even in parts of Asia. Japanese Prime Minister Shinzo Abe had to drag some of his country’s special-interest groups kicking and screaming into the Trans-Pacific Partnership. Similarly, Indian Prime Minister Narendra Modi has been unable to convince state governors to lower trade barriers within the country. In Sri Lanka, the “economic and technology agreement” that my government recently planned to sign with India, in order to bring about greater economic integration, has come under ferocious political attack. For decades, this model worked extraordinarily well, and China, Japan, South Korea, and the countries of Southeast Asia benefited greatly from it. Even today, with world trade in the doldrums, regional trade remains a key component of these countries’ growth strategies. In South Asia, however, we have been much slower to take advantage of the opportunities that can arise from more open trade — with regrettable consequences: The region is home to 44 percent of the world’s poorest people. We have an obligation to try to use trade to lift our people out of poverty. But with free trade rapidly becoming a global bugbear, the window for generating growth by tapping into world markets appears to be closing quickly. If trade is to become a key driver of growth in Sri Lanka or elsewhere in the region, we will most likely have to generate it ourselves — by transforming South Asia from one of the world’s least economically integrated regions into one of its most integrated. Today, intraregional trade accounts for just 5 percent of South Asia’s total trade, compared to 25 percent for the Association of Southeast Asian Nations. This vast untapped potential presents the region with an opportunity for growth that does not rely on the strength of the world economy. Last year, the World Bank estimated that annual trade between India and Pakistan could jump from $1 billion today to $10 billion — if tariffs and other barriers were slashed to levels recommended by the World Trade Organization. As climate change takes its toll, the stakes will only get higher. Our still largely agrarian countries, with much of their territory in low-lying coastal regions, are dangerously exposed to rising sea levels and violent weather. Receding Himalayan glaciers will disrupt the lives and livelihoods of some 600 million people in Pakistan, Nepal, and northern India. 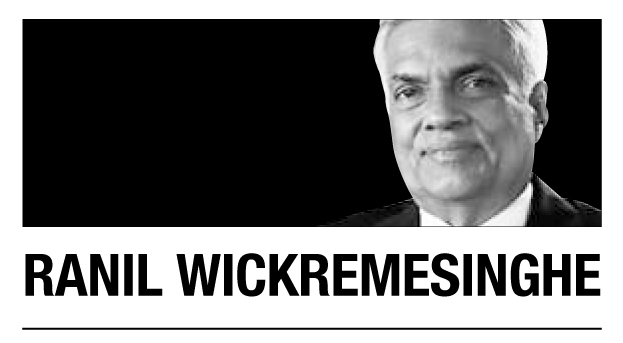 Ranil Wickremesinghe is prime minister of Sri Lanka. — Ed.